How do you translate a culture? West Side Story was a concept musical based on Romeo and Juliet that Jerome Robbins proposed to Leonard Bernstein in January 1949. It took another six years before playwright Arthur Laurents came up with the idea of two teenage gangs as the warring factions, one of them Puerto Rican, the other self-styled Americans. In November of the same year Stephen Sondheim joined the project as a lyricist and in August 1957 the stage version of West Side Story premiered in Washington D.C., with the film version released in October 1961. Successful translations take time to gestate, brew, fade and re-shape. Feuding rivalries and gang culture are older than Shakespeare and it is within the embrace of West Side Story via the 90’s Sega Megadrive video game Streets of Rage that NUE Dance Company’s Bang! To The Heart resides. Heralding from Italy and presenting in the main space at Zoo, Bang! To The Heart offers the audience a large-scale, 60-minute work with 10 dancers, a complex set, multiple projections and an original soundtrack. The narrative premise is an exact replica of West Side Story – we have the Angels (Sharks) vs Zombies (Jets) fighting for supremacy; a gang member falls for a girl, loses the respect of his allies and has to make a decision whether to follow his heart or go back to his brothers. However, it is here that the similarities end as Bang! To The Heart is a graffiti cartoon fuelled with parkour bounding, a late night riot of outrageous bboy skills and facial exaggeration. With a number of distracting side panel screens projecting fluorescent animations of bodies glitching through an urban cityscape, the main focus lands on two large, reversible, wheeled walls that offer retractable ledges, staircases and scaffolding that allow the dancers to climb, bounce and launch themselves with consistent frequency. Rattling from scene to scene, face-off to face-off, the bboying is some of the best I’ve seen; extreme flexibility and strength sees crazy hollow backs, air flares and a whole suitcase of other power moves that wouldn’t be out of place at the bboy championships. It is physically impressive and the stamina is unrelenting; even in the last ten minutes with glistening brows none of the moves lose their edge. However, it isn’t all macho posturing. There are three female dancers who’s role is little more than moving wallpaper and street dance sirens calling to the bboys with their bodies; they are lifted and thrown around with brute force; without safe practice, damage to their bodies looks likely. Just because the bboys are at ease pushing the limits of their own physicality they should not jeopardise the safety of others within the company. With so much technical skill in the cast and heavy investment in production values, the company would benefit from a dramaturgical hand, otherwise Bang! To The Heart will fill its 22:20 kitsch slot and remain a slavish West Side Story imitation with lashings of bboy talent. How do you adapt a culture? Baz Luhrmann, the director of Great Gatsby, Moulin Rouge, Australia and Romeo and Juliet has just released The Get Down for Netflix, a glossy technicolour and romanticised fable on the birth of hip hop in the summer of 1977 in the Bronx. 12 episodes made for $120 million. The first six episodes are woven around a pair of young lovers who through music try to better themselves and move away from the culture and people that forged their personalities and life experience to date. With all four elements of hip hop — mc’ing, b-boying, graffiti, dj’ing — and plenty of Puma on show, Luhrmann integrates shots of original news footage in an attempt to transport us back to the Bronx, but at it’s heart, it’s a pond skimmer: dancing on top, unwilling to break the surface and burrow beneath a rich, politicised and complex culture. Skal is a twenty-five minute work exploring macho culture within hip hop by the Swedish duo of Pontus Linder and Olov Ylinenpää (aka Lin Dylin). Dance Base presented Skal as part of Nord Dance, its festival of Scandinavian work, in November 2015 which is where I first saw it. After a second viewing I notice the visibility of child-like play and a depth of nostalgia that permeates the work. Linder and Ylinenpää start upstage seated on a picnic rug decorated with plants, records, soft furnishings and a slide projector. They oscillate between this quiet reflective space (which leaves the audience with little spectacle but the mundane re-arrangement of records or the watering of a plant) and the stage — the place where they play. Choreographically they’re reconfiguring windmills, belly swipes and air flares, slowing them down so we’re able to dissect them: we see battle tricks in duet and solo form broken down to reveal when momentum gathers and where delicate weight shifts take place. In a form that rewards either dizzying speed or precision freezes, Skal attempts to adapt the original into an alternative choreographic language; imagine bboys in treacle. As two performers who are still active on the battle scene, Linder and Ylinenpää represent different sides of the bboy coin; Linder holds his footwork in high esteem, stylishly tinkering at the edges of the melodies whilst Ylinenpää is all power moves and physical prowess. There’s a comfort and unspoken solitude between them on stage and this settles in between the gaps of performance. When they return to the rug and strike up the slide projector we see a series of kaleidoscopic amorphous shapes oozing and lolling around. Silence and space are a rare presence in the hip hop world and consequently these 25 minutes feel unusual, which I appreciate; Skal is a quiet study of the bboy and Lin Dylin happily inverts the tropes that are usually associated with it to create a balanced and playful simplicity. In the UK there are a number of artists who frame themselves as making dance/theatre that uses hip hop as their primary movement language whilst mixing other styles and influences; Vicki Igbokwe, Botis Seva, Tony Adigun, Emma Jayne Park, Benji Reid and Robby Graham — a by no means an exhaustive list — are artists who are sensitive to the origins of hip hop, offer ambitious narratives for their audiences to engage with and have been pursuing theatrical presentations of their work for the last decade or more. How do you dilute a culture? Smother by 201 Dance Company returns to the Fringe after a successful run last year that saw the company hoovering up a number of 4-star and 5-star reviews from EdFest Magazine, Broadway Baby and Scotsgay. 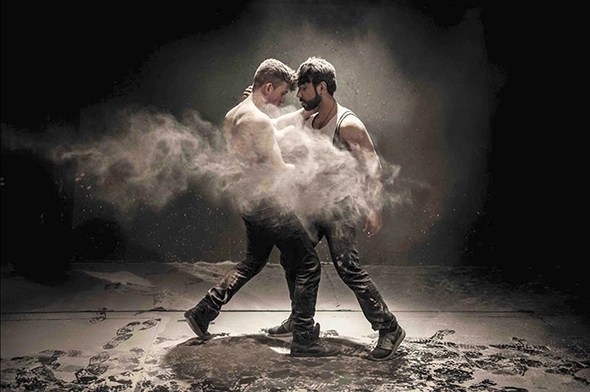 Housed on the main stage at Zoo, the company of seven dancers explores the story of two men’s broken encounter whilst touching on the themes of addiction, obsession and commitment. 201 presents homosexual relationships in hip hop as sensitive territory but if you consider the history of hip hop and the funk styles of waacking, voguing and the balls that emerged in the late 70s and continue today there has been consistent and active communities within hip hop that are not defined by their sexuality. These communities kept themselves underground because of the intolerance of others to accept different types of bodies and beliefs; inside and outside hip hop the prejudices they encountered are still alive today, and I’m unsure whether attitudes are thawing or not. Artistic director, choreographer and dancer Andrea Walker is to be applauded for attempting to explore this area as few in the UK have done so to date. However, for over 55 minutes we are presented with a number of low-quality commercial street dance routines — truncated to match the length of a pre-existing musical tracks — interspersed with faux, angsty dacting (dance acting). The routines are loose, unsymmetrical and there is an inconsistency across the dancers in terms of who is and is not able to hit the beat or understand the musical texture and nuance required. The dacting sections bear no relationship to the routines (which repeat motifs and material multiple times) and the physical encounters offer a uni-dimensional representation of relationships that are angry, promiscuous and unsubtle. Walker is noticeably the weakest dancer; he gives himself a lead role, often front and centre of the arrow formation, yet his execution has little attack and is always a beat behind. Smother lacks emotional subtlety, historical awareness and presents a series of shallow sub-standard choreographies that could be found in an improvers street dance class at Pineapple. You have to know where hip hop has been to know where it can go.